With a subtle 3M reflective touch. 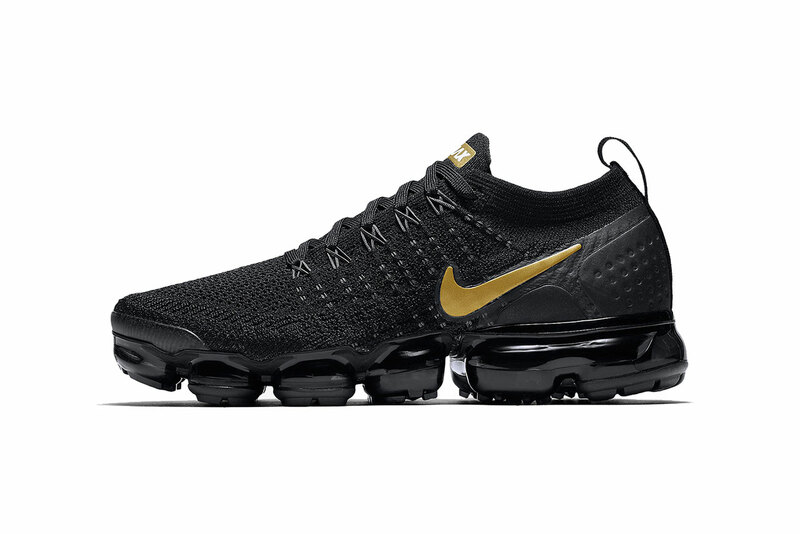 Earlier in the week, we shared a look at the Nike Air VaporMax 2.0 in “Vast Grey.” Today, the model surfaces once more in a contrasting color scheme — the lightweight runner welcomes “Black/Metallic Gold-Metallic Platinum.” As seen, the Flyknit upper sports an all-black treatment to match the blacked-out Air VaporMax unit. Gold accents are incorporated onto the lateral Swoosh in addition to its VaporMax insignia on each tongue. Lastly, you’ll find a small 3M reflective strip down each heel for a final touch of flair. The Nike Air VaporMax 2.0 “Black/Metallic Gold” is currently available in women’s sizing at select Nike Sportswear retailers such as Shoe Palace and Finish Line or $190 USD. Air VaporMax fans can also check out what Nike has in store for its 2019 edition. 12 songs and 28 minutes of pure melody. The second 700 colorway lands this month. One of the biggest ‘Astroworld’ tracks. The husband-and-wife duo presents their largest show yet.